LONGVIEW, Texas – Scoring the first eight points of the game, the LeTourneau University men’s basketball team would jump all over visiting Howard Payne University by a halftime score of 55-32 en route to picking up a 99-60 victory at Solheim Arena on Saturday, December 8. LETU has now won three straight games to improve to 6-4 overall and 3-1 in American Southwest Conference play while HPU falls to 2-7 overall and 1-1 in ASC action. A jumper from senior Caleb Loggins along with back-to-back transition triples from Nate West would put LeTourneau up 8-0 just 77 seconds into the game as HPU would have no response to LeTourneau hitting their first three shots of the game. West would continue his furious pace to start the game by hitting a pair of free throws to give LETU a double-digit lead at 12-2 with 16:56 remaining in the first half before seeing the point grow to 16 at 24-8 on Christian Seidl three that would force Howard Payne to take a timeout. The LeTourneau run would continue out of the break as nine straight points would put LETU up 33-8 with 8:58 left before halftime with Elijah Gerber knocking down a jumper in the paint. Seth Mattson would get in on the scoring effort for LeTourneau with 4:40 remaining before halftime by knocking down a three as LETU would connect on eight treys in the first half to lead by 32 at intermission and looking to put the game away early in the second half. 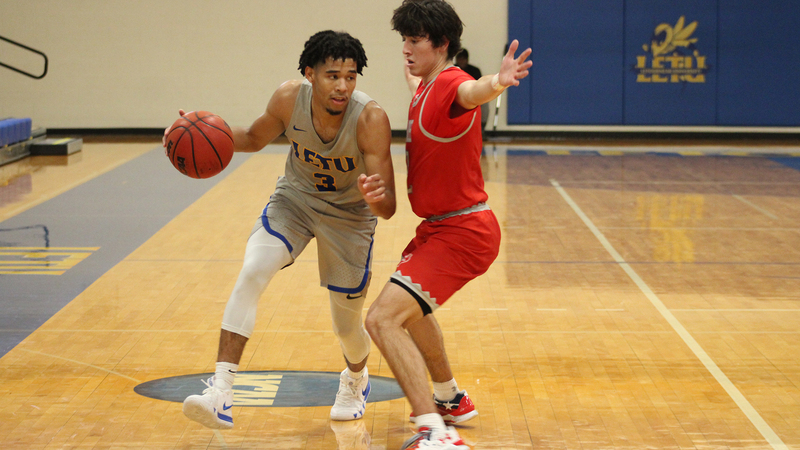 Back-to-back treys for LETU started the second half as Justin Moore and Kyle Matthews ignited a 10-2 run which would put LeTourneau up 65-25 with 17:27 remaining in the game. Things would continue to go LeTourneau’s way throughout the second half, with Loggins getting a transition layup from West to give LETU their largest lead of the game at 77-32 with 13:57 left in the contest. Hitting the 88-point mark with 6:21 remaining, LETU would look to run the century mark for second time this season before letting off the gas to end the game as a Garrett Beene triple with 50 ticks left on the clock finished the scoring with LeTourneau just a single-point shy of 100 while matching their largest margin-of-victory this season. The balanced LETU effort would come as no player would log more than 27 minutes in the contest with 14 players combining for the 99-point output. Finishing with a 50.6 percent (40-of-79) shooting percentage from the field, LeTourneau hit 13-of-34 (38.2 percent) of their three’s while scoring 46 points in the paint and 17 second-chance points. Doing most of his scoring in the first half, West would net a game-high 18 points after scoring 15 in the first half while falling just one assist shy of a double-double (9). LeTourneau’s next regular-season game will come on Saturday, December 29 when the YellowJackets close out non-conference play with a 3:00 p.m. home game against Millsaps University. LETU will play an exhibition game against Louisiana State University-Shreveport next Saturday, December 15 at the Gold Dome on the campus of Centenary College at 3:30 p.m. as part of the Shreveport Classic. LONGVIEW, Texas- Despite their best offensive performance of the year, the LeTourneau University women’s basketball team would be unable to get past Howard Payne University by a final score of 78-62 at Solheim Arena on Saturday, December 8. LETU drops to 1-7 overall and 0-4 in American Southwest Conference play while HPU moves to 4-5 overall and 1-1 in through two games of ASC action. A sloppy start for both teams was displayed early as two turnovers by LeTourneau, and one from Howard Payne led to a slow offensive start on both ends. HPU was able to break through and find the hoop first on a shot behind the arc to put them up 3-0 with 8:13 left in the first quarter before Sha’Donnaver Young answer with a three-point play for LETU to deadlock things at 3-3. LeTourneau would do their best to keep the ball game close in the opening 10 minutes of action as by responding to HPU’s shots early in the quarter as both teams would endure a 2:30 scoring drought midway through the period. It would be Howard Payne who would end the drought and take a 14-8 lead before taking on one final triple to end the quarter with the score 17-8 in favor of HPU. 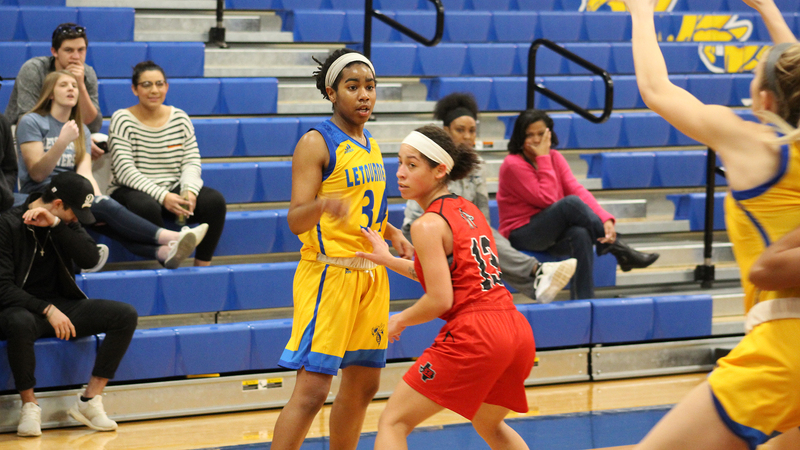 Chauntel Acosta would enter the second quarter on fire for LeTourneau as she would connect on two three-point field goals within the first minute of action to help pull LETU back within three at 17-14. The Hereford, Texas native would continue to take charge for LeTourneau by hitting one more triple to pull LETU within a single-possession at 19-17. Offensive rhythm for both squads continued to be shown throughout the final five minutes of the first half as Howard Payne would claim a 38-32 advantage at intermission. HPU would come out of the locker room and score the first points of the third period before allowing a 5-0 LETU run making the score 42-37 as LeTourneau would remain within striking distance. As the teams continued to exchange shots, HPU would lock down on defense to take a double-digit lead at 55-45 before seeing Jaila Leaven connect on a triple to end the third quarter with LETU trailing 55-48. Playing from behind eventually caught up to LeTourneau as LETU would be unable to close the gap due to an 8-0 run midway through the fourth quarter as HPU hold a 23-14 scoring advantage in the fourth to claim the win. Young led LETU with 16 points with Acosta following closely behind by posting a season-high 14 points. 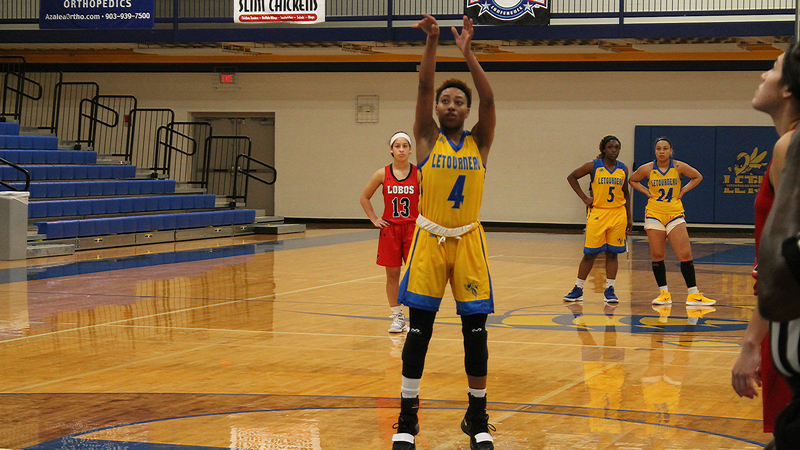 Alexandria Thorne recorded a team-high four assists while Keauna Whitfield added a team-high nine rebounds as LeTourneau held a 41-39 advantage in rebounds. LETU managed to shoot 31.7 percent (20-of-63) from the field, putting up a nearly identical performance in the second half (10-32 in the first half, 10-31 in the second half). HPU used the turnover ratio to their advantage as they turned their 21 forced turnovers to score 19 points while LETU only came away with eight points off 13 Howard Payne turnovers. LeTourneau will step outside of ASC play as they travel to Dallas, Texas on Tuesday, December 11 to take on Dallas Christian College at 5:30 p.m. Dallas Christian College will enter Tuesday’s game coming after winning their past two games to improve to 3-4 overall. LONGVIEW, Texas – With five players in double-figures led by the second-career triple-double from junior Nate West, the LeTourneau University men’s basketball team managed to drive for nearly the entire game to pull away late for a 94-69 drubbing of Sul Ross State University at Solheim Arena on Thursday, December 6. Winners of two straight, LETU improves to 5-4 overall and 2-1 in American Southwest Conference play while the Lobos dropped to 1-4 overall and 0-2 in ASC action. Jumping all over SRSU right out of the gates, the YellowJackets would score the first seven points of the game before seeing Sul Ross settle in to close within three at 10-7 heading into the first media timeout with 15:54 left in the first half. After trading buckets for the next few minutes of action, Sul Ross would cut the LeTourneau lead down to one at 12-11 before seeing a 9-0 run capped off by a C.J. Bird triple midway through the opening period put LETU up double-digits at 21-11. LeTourneau would manage to keep their lead in the double-digits for most of the rest of the first half as the Lobos would be unable to string together any runs that would cut into the YellowJacket lead to trail 38-29 at the break. West would prove to have the hot hand entering the second half, book-ending an 8-1 LeTourneau run with a triple and three free throws to put LETU up 46-32 as the YellowJackets would threaten to put the game away early. Sul Ross would respond by scoring eight of the next 10 points by pushing the tempo and trying to put pressure on LeTourneau which would lead to easy transition points for SRSU as the Lobos would close the gap to 48-40 with 14:10 remaining. The LETU lead would be cut to seven heading into the final 10 minutes of play before a Caleb Loggins layup along with free throws from Justin Moore, and Korrin Taylor pushed the YellowJacket lead to 62-51 and put the pressure back on Sul Ross as time would begin to go against them. 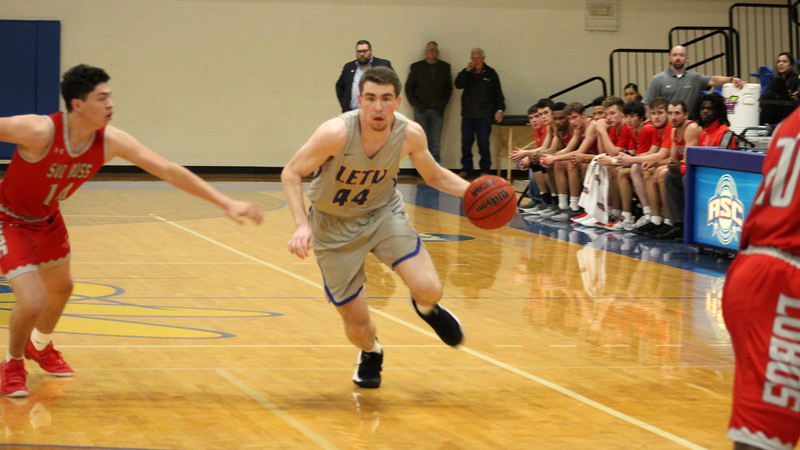 Pushing their lead to 14 at 69-55 with 7:25 remaining, LeTourneau would keep their foot on the pedal and not let up as the Lobos would not have an answer for the LETU attack that would put up 56 points in the second half to earn their second-largest margin of victory this season at 25 points. West’s triple-double came as the Houston, Texas native scored a game-high 24 points to go along with 10 rebounds and 10 assists while going a perfect 14-for-14 at the free throw line. LETU would never trail in the game, scoring 46 points in the paint and gaining 27 points off 22 Sul Ross State turnovers. The Lobos would also find themselves with five players in double-figures, led by 14 points from Jack Kirkpatrick who would be limited to only 19 minutes of play due to foul trouble. LeTourneau closes out pre-Christmas action with a 3:00 p.m. battle of the YellowJackets when Howard Payne University comes to Longview on Saturday, December 8. Sitting atop the ASC West standings, HPU will enter Saturday’s contest with a 2-6 overall record but 1-0 mark in the ASC after defeating Texas-Dallas in their last game. LONGVIEW, Texas – Playing in front of their home crowd for the first time this season, the LeTourneau University women’s basketball team found the Sul Ross State Lobos too hot to handle in a 66-52 defeat in an American Southwest Conference matchup on Thursday, December 6. The loss drops the YellowJackets to 1-6 overall, and 0-3 in American Southwest Conference play while the Lobos advanced to 3-4 on the season and 2-1 in conference action. Sul Ross State scored the first nine points of the game, taking advantage of five LETU turnovers through their three-quarter court pressure. A layup from Olivia Eweni put a spark in the LETU offense as teammates Sha’Donnaver Young, and Keauna Whitfield followed, stringing together six straight points to cut the Lobos lead to 13-10. Sul Ross would stay hot as SRSU responded with an 11-2 run to start the second quarter go up 29-15 and threatening to extend the margin before halftime. Trying to gain momentum before intermission, LETU found some rhythm as they put up ten points in the final five minutes of the period to trail 42-25 after 20 minutes of action. The third quarter proved to be the strongest of the game for LETU as they scored 14 points and cut the Lobo lead to as few as nine before conceding the final four points of the period to SRSU to go up 51-39 heading into the fourth quarter. An attempt to cut the Lobo lead down to single-digits once again, Alexandria Thorne got LeTourneau on the board with a jumper before seeing Sul Ross respond with a layup to trade buckets in the opening minute of the fourth. LETU would score eleven points while forcing nine turnovers in the final period, but it wouldn’t be quite enough to halt the Sul Ross offense as the Lobo attack through the first three quarters proved to be too much to overcome. Young led the YellowJackets with 14 points going 1-3 from the three-point line while Eweni followed close behind by putting up 12 points of her own. The Lobos used their defensive performance to their advantage as they thrived off 26 LETU turnovers which led to 29 points on the offensive end. The YellowJackets would force the Lobos into 21 turnovers but could only net six points off the opportunities. Falling back to old habits, LETU would finish the game with just a 25 percent (16-of-64) mark from the field as the Lobos shot just shy of 40 percent (26-for-66, 39.4 percent). LeTourneau will stay at home this weekend as they face Howard Payne University in their fourth American Southwest Conference matchup on Saturday, December 8 at 1:00 p.m. HPU will enter Saturday’s game with a 3-5 overall record and are coming off a 73-58 conference loss to Texas-Dallas.